He’s such a good sport and playfully let me take pictures of him with a pair of sunglasses on. This kid is such a ham… he loves the camera, loves having his picture taken, and insists on looking at the pictures when we’re done. Sometimes he’ll even approach me first, asking “Pictures? Please?” in an attempt to get me to break out the camera and take some pictures. We are truly blessed to have such an awesome little boy with such a big personality! 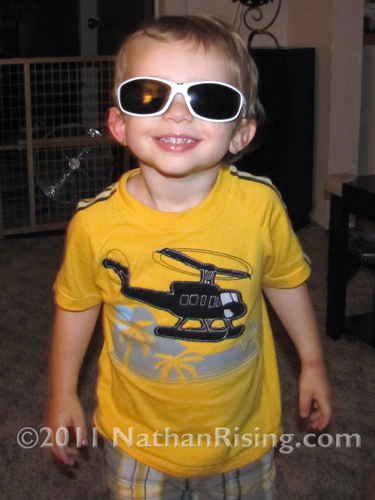 This entry was posted by Jen on October 14, 2011 at 7:53 pm, and is filed under All About Nathan. Follow any responses to this post through RSS 2.0.You can skip to the end and leave a response. Pinging is currently not allowed.